At last, the next waypoint. Got the itinerary right here. We are off to the Conflux Abandoned Settlements, wherever that is. And this time they are looking for help mapping some of the region. Now this is why I joined up. Explore new systems. Time to leave this moon and get started. Oh so, funny story. Shortly after I recorded my last log, I heard some startling news. Apparently fighting broke out between the local mining corporation and the worker's union. Yup, they started shooting at each other while we were here. As you can guess, I got the hell out. I mean, after all the cartography data I gave them I became quite friendly with corporate management. While at the same time I relied on workers to maintain my ship. Hm. Now that I think about it, I should have one of the expedition mechanics check my FSD. Last thing I need is for someone to sabotage my ship. What the hell. First pirates pick off explorers at Pallaeni. Now a civil war breaks out in the Omega Nebula just as we are passing through. I thought this was going to be a nice peaceful expedition! Well here is hoping this next leg is less dangerous than the last. Next stop, NGC 6629. Ah who am I kidding. I am going to stop at plenty of stars before I hit the first POI. So much to explore. So much to see. End recording. Ok. If I did this right, there should be a log header at the top of this entry. So this is me reminding myself, check for a header. Man, until this expedition I had never used the Logbook function in any of my ships. So many options to play with. NGC 6629 was very pretty, but didn't see much beyond a star. Maybe I missed something. In any case, I set course for the next POI. But before I headed out, I jumped several times on a path perpendicular to the route. Then re-plotted. Sure enough, I found several unmapped star systems. I absolutely love jumping into a new system. It is like a little secret prize box. What is this one going to have? Will this one have something wonderful and amazing never before seen by human eyes? 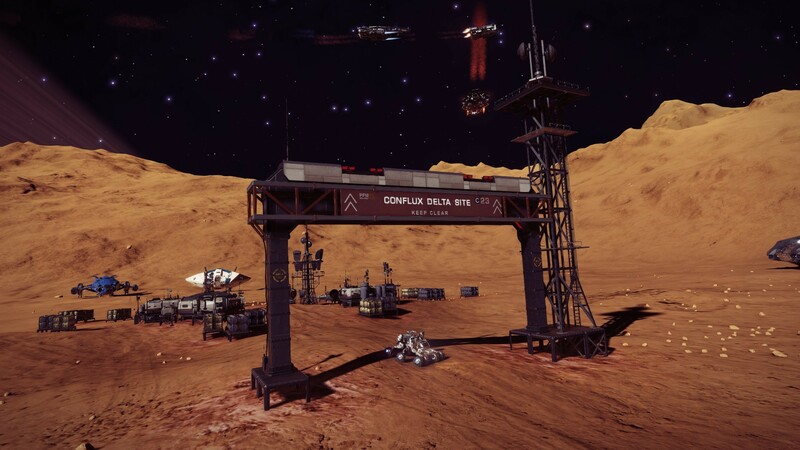 I am now at Eagle's Landing, a tiny outpost run by the Colonia Council. I was surprised at how many outposts we've come to outside the Bubble. But a Colonia rep educated me a bit on the sprinkling of locations way out here, especially between the Bubble and Colonia. I am now about two jumps from Waypoint 3. Decided to poke around some nearby star systems before hopping into the system with the abandoned settlements. The system I am in now is pretty well populated with heavenly bodies. M-class/L-class binary star system. I am currently landed on the surface of a planet orbiting the second star. 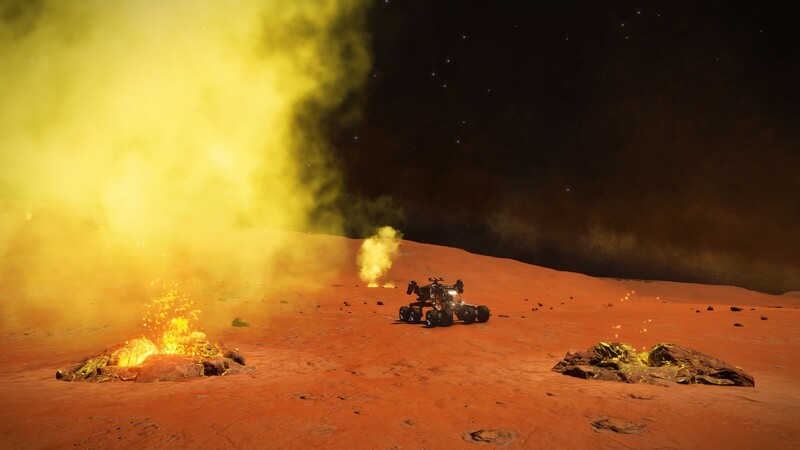 Detected some iron magma. I investigated one site in my SRV. It was nice ride. Surface is pretty smooth, so pushing the throttle up isn't suicidal. But so far no lava spouts. Let's see. After Eagle's Landing, I headed over to Eudaemon Anchorage. Was nice to be able to dock at a Coriolis station. After a little rest there, I made my way here. And like before, the trips to and from Eudaemon were along a deviated path from the direct one. Searching for more unexplored systems. And boy did I found them. A lot of them. Mostly rock and ice worlds as one would expect. But every once in a while I would find a really fascinating planet. Like I found a gas giant with three rings, and analysis of the 2nd ring found over a dozen mining hotspots. I also found an ice world with what the computer said was one ring but sure looked like four to me. So many pretty amazing sights. I am going to have to re-think all the ways I want to contribute to this expedition. The sad fact is I don't have the time for everything. I cannot survey every star system, investigate every anomaly, and submit every piece of data. Besides, I have my own data collection to do. I keep track of all stellar bodies I am first to discover. Not going to stop now. Maybe I will drop anomaly reporting. Or wait and submit them in groups. It is the most clunky process. I also need to think about how often I want to record these log entries. Should I be methodical, reporting in regularly regardless of what happens? Should I only record these when something of interest happens? Or should I do this whenever I feel like rambling into a mic? Who knows. I visited the Conflux settlement. It was pretty busy when I arrived. Over a dozen ships. Half on ground, half circling overhead. I haven't seen that many commanders together since the expedition launch. So after circling the area, I did land on the perimeter of the settlement. Hopped into my SRV and roamed the area. It was a good time. The settlement itself was fascinating. My data scanner found logs of an ill-fated voyage. Overall definitely worth the visit. It was also nice to see some of my fellow expedition commanders. Good group of people, friendly and helpful. Well, mostly. I ended up cutting my stay there short after the shooting started. I don't know who fired the first shot. My guess is someone not affiliated with Distant Worlds 2. The first sign of trouble I saw was when several ships in flight began firing upon one of the Anacondas parked on the ground. When that happened, all hell broke loose. Ships were taking off and blasting each other. I thought about launching too. I mean, I am a sitting duck on the ground with no shields and no defensive measures. Pretty scary. But watching four or five Anacondas launch at the same time and begin firing at someone outside my view...? Yeah I was better off not attempting to fly through that. But as soon as the situation settled down I took the opportunity to leave. Oh, I found my lava spout. On a planet orbiting Pru Aescs PX-L d7-360. Finally! Another entry in the Codex completed. It was a good site too. Nice and flat. Took the opportunity to ride around in the SRV and collect some minerals. And speaking of mineral collection, I parked where I am now so I could gather some Polonium. Got a decent six units from one site. Now all I need is some more Arsenic and I can synthesize some premium jumponium. Well. Guess it is time for me to bundle these entries up and submit. "In the event things go awry" they said. Let's see, after that I should probably send the Science Department my latest report. And see if there is anything for the Geology Department. Oh before I log off. Another commander suggested I include images in the logs. I have been taking pictures, but didn't realize I could attach them to my log entries. So.. assuming I do this correctly.. enjoy some pics from today's events.